Gene therapy has the potential to restore hearing in mice, offering hope for humans too, US scientists suggest. An Oregon team discovered gene transfer produced functioning hair cells that are essential for the inner ear to interpret sounds, Nature reports. In people with normal hearing, cochlear hair cells convert sound into electrical signals, which are ultimately transmitted to the brain. Once the cells are lost or damaged, they cannot be replaced naturally. According to the Royal National Institute for Deaf People (RNID), there are about nine million people who are deaf or hard of hearing in the UK. 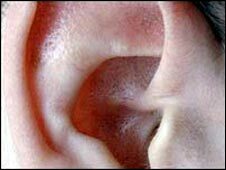 Most of them have lost their hearing gradually with increasing age, partly due to the loss of hair cells in the cochlea. Prolonged exposure to loud noise is another culprit, damaging the hair cells. John Brigande and his team from Oregon Health and Science University showed, at least in unborn mice, gene therapy can be used to encourage other cells to become hair cells. Gene therapy uses a harmless virus to insert copies of the key gene into cells which then replicate. The key gene used by the Oregon team was Atoh1 which is essential for hair cell development. The cells "treated" with Atoh1 functioned exactly like original hair cells. "This capability is a crucial first step in defining translational therapies to ameliorate the effects of inner-ear disease in humans," the researchers said. Work in humans is still a way off, but the findings point to a way to repair the damaged cochlea without using a mechanical or electrical device. Currently, people can have a cochlear implant which works by bypassing the damaged cochlear hair cells and stimulating the auditory nerve directly. An implant cannot restore hearing to normal but it does give the sensation of sounds. Andy Forge, Professor of Auditory Cell Biology and advisor to Deafness Research UK, said: "Although still a long way from the clinic, the work shows that gene therapy is a potential treatment to combat some forms of congenital deafness. "With one in 2,000 children born deaf because of genetic defects, such a therapy would clearly be of value." Dr Mark Downs, of the RNID, said: "This is an exciting development which completes another important piece of the jig-saw in understanding how we might use gene therapy to eventually restore hearing loss."